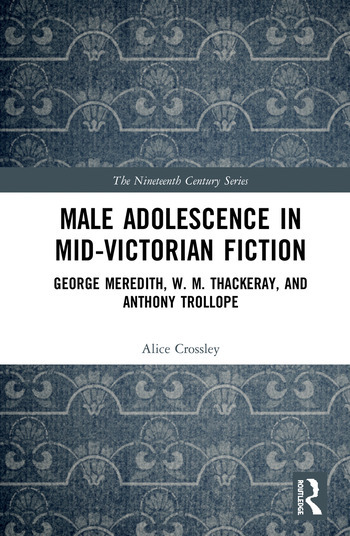 Focusing on works by George Meredith, W. M. Thackeray, and Anthony Trollope, Alice Crossley examines the emergence of adolescence in the mid-Victorian period as a distinct form of experience. Adolescence, Crossley shows, appears as a discrete category of identity that draws on but is nonetheless distinguishable from other masculine types. Important more as a stage of psychological awareness and maturation than as a period of biological youth, Crossley argues that the plasticity of male adolescence provides Meredith, Thackeray, and Trollope with opportunities for self-reflection and social criticism while also working as a paradigm for narrative and imaginative inquiry about motivation, egotism, emotional and physical relationships, and the possibilities of self-creation. Adolescence emerges as a crucial stage of individual growth, adopted by these authors in order to reflect more fully on cultural and personal anxieties about manliness. The centrality of male youth in these authors’ novels, Crossley demonstrates, repositions age-consciousness as an integral part of nineteenth-century debates about masculine heterogeneity. Note on Textual Editions. 1 Introduction. 2 The Bildungsroman and Advertising: Thackeray. 3 Manly Conduct: Meredith and the Culture of Improvement. 4 Investments in Youth: Speculation and Liberal Adolescence in Trollope. 5 The Language of Filial Dialogue in Meredith. 6 Aberrant Youth: The Dandy, the Wild Man, and the Deviant. Conclusion. Bibliography. Alice Crossley is a Senior Lecturer in English Literature at University of Lincoln, UK.